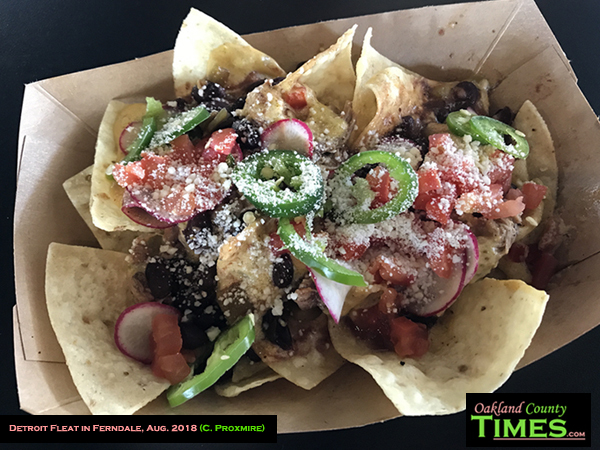 Ferndale, MI – I’m combining a couple visits together for this Reporter Food column, because really the noteworthy thing about Detroit Fleat in Ferndale is the mix of food choices. That’s because Fleat is actually a restaurant with a food truck court attached. 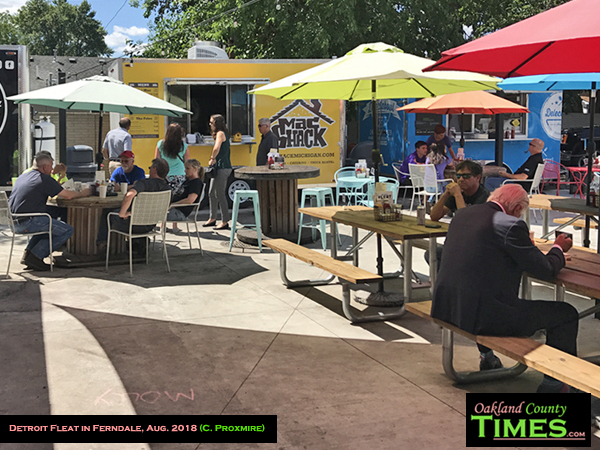 The trucks change, but Mac Shack is one of the regulars. Last time I wrote about Fleat, it was the Mac Shack Papa Smurf that struck my fancy. 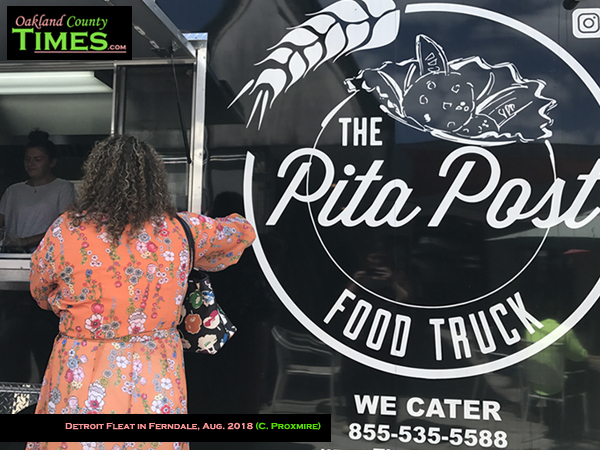 Upcoming trucks include The Drunken Rooster Mexican food, Matt & Mo’s for Chicago Beef, Streetside Sushi, and Press- Coffee and Waffles. The past couple times I’ve ordered off the indoor menu, as did my lunchtime companions. One time it was tacos, which you can see below are lovely. These are pork with pineapple chutney and pickled red onion. They also come with fried jalapeno but I asked for mine without. On another visit I came to do an interview over lunch. The Cherry Chip Cold Brew Cocktail was a great warm up. It was made with house-made cold brew coffee, Old Forrester Bourbon, bourbon cream, Lunarido Liquor, and chocolate bitters. 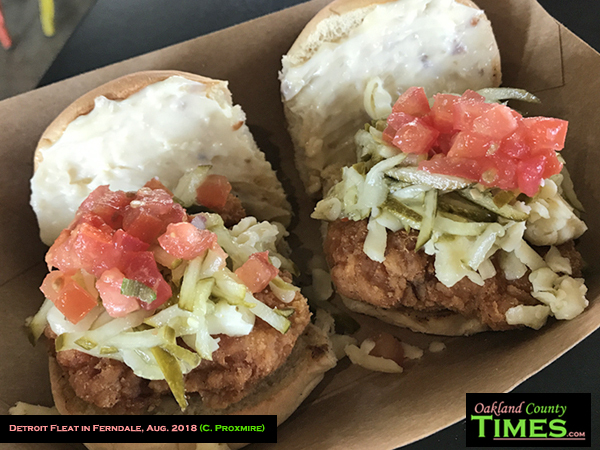 My interviewee ordered the pulled pork nachos and the buttermilk fried chicken sliders which came topped with diced tomato, pickle slaw and roasted garlic aioli. 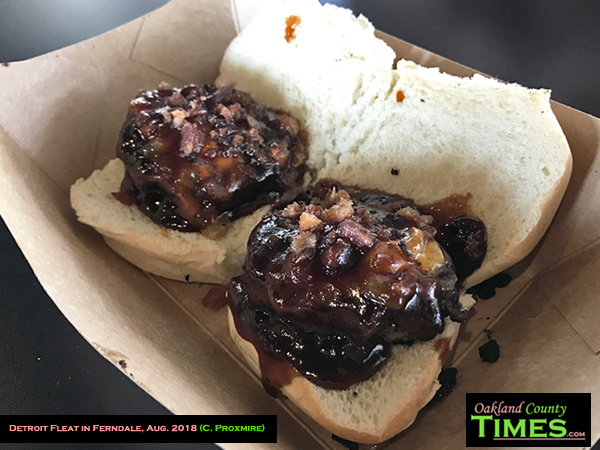 I ordered the whiskey bacon beef sliders which came with smoked cheddar, caramelized onion and Michigan Distilled Whiskey BBQ Sauce. It’s fun to try the different things inside and out. 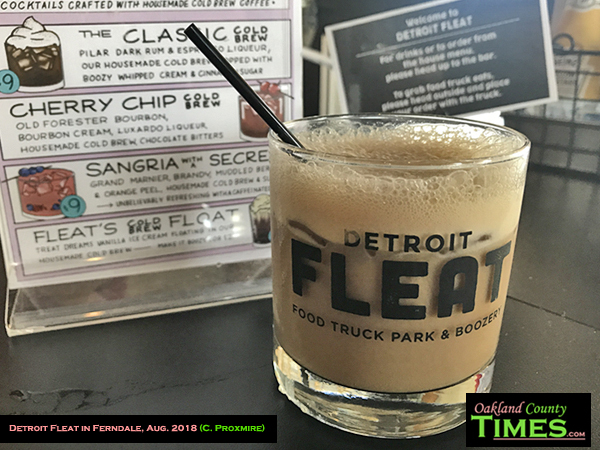 Detroit Fleat is a sponsor of Oakland County Times. They are located at 1820 E 9 Mile Rd, between Hilton and John R, across the street from Chazzano’s. 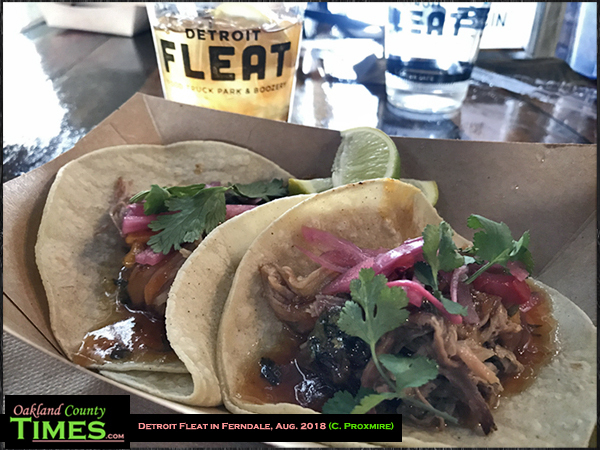 Check them out online at http://detroitfleat.com.